I present methods that can be used to obtain algebraic solution of polynomial equations of degree five and above. 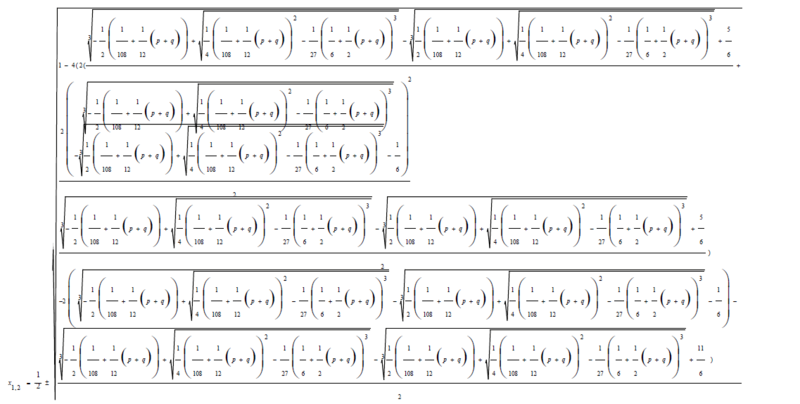 In this contribution I look into methods by which higher degree polynomial equations can be factorized to obtain lower degree solvable auxiliary equations. The factorization method has been used to successfully solve quartic equations. A careful selection of the appropriate factorized form can bear much fruit in solving higher degree polynomial. Ehrenfried Walter von Tschirnhaus (1651-1708) invented the Tschirnhaus transformation. The Swedish algebraist Erland Bring (1736-1798) showed by a Tschirnhaus transformation that the general quintic equation can be transformed to the trinomial form. The English mathematician George Jerrard (1804-1863) generalized this result to higher degree polynomial. The possibility of solvability of higher degree polynomials would pave way for transformations that can reduce higher degree polynomials to their trinomial form. The Newton Identity relates the roots of polynomials with their coefficients. It is possible to introduce an instantiation of this formula where a root of polynomial is correlated to its coefficient. This is in order to facilitate easy reduction of polynomials to lower degrees for solvability. Once a polynomial is reduced to solvable lower degree forms and there consequent roots it is possible covert it as a root of the degree of original polynomial. The paper will seek to address briefly on the things highlighted in this abstract. Solvability of higher degree polynomials will of necessity call for a re-examination of the Abel-Ruffini impossibility theorem and the Galois Theory at large. In math a Resolvent is an equation upon whose solution the solution of a problem depends. For the purpose of this paper I will touch on a few highlights of the Lagrange Resolvent. where x_i, i=1,. . . , n, are the roots of the equation and ω is an nth root of unity. Where xi are the roots of the cubic equation and ω is the cube root of unity. By permuting these roots into each other we get six different values of z. The equation is then formed. The above equation is quadratic in x3. The importance of the Lagrange resolvent is its ability to solve the cubic and even quartic equations. However if a similar construction is made with a quartic equation it would yield a solvable equation of degree 24. With the quintic equation however the Lagrange Resolvent would yield an unsolvable degree 120 polynomial equation. The Lagrange resolvent failed to provide a way forward to the solution of higher degree polynomial equations. is a Galois resolvent if one gets n! different functions when permuting the roots with each other. The Galois resolvent is then used to form the polynomial where vi are symmetric functions of the roots of the polynomial. With His group theory Galois made the observation that because it is impossible to have a chain of groups for permutation groups of S n ≥ 5 then it is impossible to solve algebraically equations of degree five and above. Galois Theory identified criteria for obtaining solvable cases. has a rational root. If this is the case the sextic factors into the product of a linear polynomial (x - θ) and an irreducible quintic g(x). I will show later in this paper how this sextic can be reduced to linear and quadratic factors. Edward Thabo Motlotle , in his 2011 master’s thesis managed to present a formula for solving the Bring-Jerrard quintic equation using the Newton’s sum formula. In his contribution Motlotle convincingly argued that Abel’s impossibility proof has been misconstrued by many as meaning that no general algebraic solution of the quintic equation is attainable. He showed that such a formula in unattainable only within a field of Rational numbers. He then moved on to deriving a formula. Motlotle demonstrated that the Galois group associated with the general quintic equation is solvable over algebraic numbers. Could it be possible that the Galois Theory is incomplete in its treatment of higher degree polynomials? What about the Lagrange and Galois resolvents, are they all that the mathematics principles can provide in the solution of higher degree algebraic equations? Is it possible to come up with factorized forms that can be used to solve higher degree polynomials? Is it possible to come up with instantiations of the Newton’s sum formula? In the most general sense, the newton’s identity is a correlation between roots and coefficients of a polynomial equation. Could it be possible to come up with a correlation connecting the coefficients of a polynomial to a single root? If such a correlation can be obtained should make it possible to factorize a degree n polynomial to linear and degree n-1 factors. Is it possible that after reducing a higher degree polynomial and obtaining solutions in terms of lower degree polynomial to covert the same in forms of roots of the original polynomial? In this paper I will seek to present methods of factorizing higher degree polynomial s to solvable forms. I will seek to present an instantiation of Newton’s identity that can be used factor linear factors from out polynomial equations. I will seek to show that the sextic equation of Dummit’s proof theorem is reducible to quintic and linear factors. The main objective of this paper is to show that algebraic equations of degree five and above are solvable algebraically. Specifically I will seek to present a method by which a degree n polynomial can be factored to a linear factor and degree n-1 polynomial. I will seek to present solvable factorized forms of polynomial equations. I will seek to present a method of converting back a root to nth root form where the polynomial has been reduced to lower forms and roots have obtained in lower forms. Abstract algebra asserts the impossibility of solving a general algebraic equation of degree n ≥ 5 because the Alternating group is simple that is it does not permit normal subgroups. In the paper “Solution of Solvable Irreducible Quintic Equations, without the aid of a Resolvent Sextic” , George Paxton Young asserts the irreducibility of the Bring-Jerrard quintic equation. G.P. Young, on the basis of irreducibility of the quintic equation in the trinomial form, argues further that it cannot be solved algebraically except in particular cases. G.P. Young then brings in exogenous quantities or parameters by which the most general solvable cases of the Bring-Jerrard quintic equation can be determined algebraically. Young introduced the rational functional relations and as his most general cases. Then he was able to determine the roots in terms of A, B.
I will seek to use the approach of Young to propose a possible method of solving the quintic equation and higher degree equation. Since the parameterization of Young did not yield a complete solution, I will seek to modify it to achieve a general solution. The trinomial quintic equation has two parameters. I seek to introduce a parameterization in which one of the parameters is a root of the algebraic equation and the other parameter/parameters are the coefficients of the equation. Such a parameterization is as a matter of fact an instantiation of the Newton identities. Newton identities can be viewed as a parameterization which correlates the roots and coefficients of the polynomial equation. To reduce the Bring-Jerrard quintic, I introduce the functional relation p =φ ( A,q) Then the roots will be determined in terms of A, q. Whenever such relations are found then the polynomial has a general algebraic solution. In this research I will extend my argument to irreducible algebraic equations of degree n. I will show that such equations are reducible in the most general sense. Thus I will show that algebraic equations of higher degree are always reducible. In this paper partial reference will also be made to my previous contributions in the area [10,11]. I will seek to show that there are factorable forms that are very effective in solving higher degree polynomials. In the event formulae of a polynomial equation is given in terms of lower degree polynomials because of factorability, I will seek to present a method in which the root can be converted to an order equal to the degree of the polynomial. can be used to reduce it to quartic and linear factors. To illustrate, if in the above quintic equation, if we take A = 1 and q =1, then p = -2. One of the roots is therefore 1. If we take A = 5 and q = 10 then p = -627. One of the roots of quintic equation is 5 and so on. Thus the Bring-Jerrard quintic equation is solvable in the parameter A and q. It is however more desirable to solve it in parameters p and q. A further analysis shows it is still possible. This will be discussed further in the paper. can be used to reduce sextic to linear and quintic factors. If in the above sextic equation we take One of the roots of the sextic equation is 1. If we take B = 5 , b5 = 4 , b6 =1, then 0ne of the roots of the sextic equation is 5. It is however more desirable to obtain solutions of higher degree polynomials in terms of the endogenous parameters. Note the above parameterizations involve connecting between a root of a polynomial equation and its parameter. 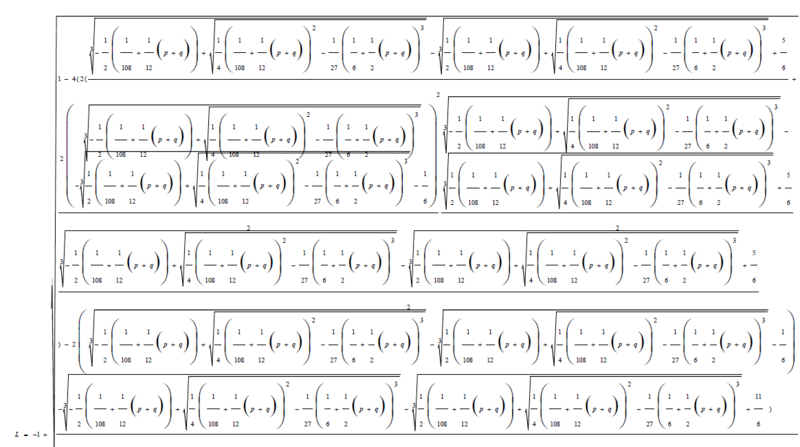 The Newton’s sum formula can be viewed as a generalization of the above instantiation. has a rational root. If this is the case the sextic factors into the product of a linear polynomial (x - θ) and an irreducible quintic g(x). In chapter 2 we saw that higher degree polynomials are always reducible. It is still possible to identify ways of reducing higher degree polynomial to produce quadratic, cubic and even quartic factors . In this paper I will discuss possible factorization forms to achieve this. The Factorized form 0.2 of the Bring-Jerrard quintic equation is solved by substitution of the above coefficients in the auxiliary cubic and quadratic equations. Where ω is the fifth root of unity. Thus the roots of the quintic equation are obtained by substituting the value of L in 1.6 into equations 1.1 to 1.5. The advantage of the above formulation is that it puts all polynomial equations under the same formula structure. I have used this example to illustrate with quintic equations but it can be extended to higher degree polynomials. There are a variety of techniques of solving algebraic equations of degrees greater than four degrees. The failure of the Lagrange and Galois resolvents to provide general algebraic solutions does not in any way mean that such solutions don’t exist. Abel – Ruffini impossibility theorem is incomplete in the sense that it did not exhaust all avenues of algebraic solution of higher degree polynomial. The proof was based on the limitations of the approaches used then. Galois Theory needs a fresh re-examination. There exists a framework under which formulae of polynomial equations of degree two and above take the same structural form. Abstract algebra needs a re-writing to enable other branches of mathematics and science that depend on it to grow. I recommend an active research be initiated on solvability of higher degree polynomials. I would like to express my since gratitude to the following: The Almighty God for making this piece of work successful. My wife for her Julie Ahadi encouragement and service. Stillwell J. Mathematics and Its History, Springer-Verlag, New York, 1989. Lagrange LJ . Reflections on the agebric resolutions of equations. Gallica, 1770. Rosen MI. Neils Hendrik Abel and equations of fifth degree. Amer Math. 1995;102:495-505. Livio M. The equation that couldn’t be solved: How mathematical genius discovered the language of symmetry. Simon & Schuster, New York, 2006. Bring ES. Meletemata some mathematematica the transformation of algebraic fair-tion. Quart J Math. 1786. Jerrard GB. An essay on the resolution of equations. Taylor and Francis, Red line court, Fleed Street. 1859. Dummit DS. Solving solvable quintics. Math Comp. 1991;57:387-401. Motlotle ET. The Bring-Jerrard quintic equation, its solution and a formula for the universal gravitational constant uir. unisa ac za. 2011. George P Y. Solution of Solvable irreducible quintic equations, without the Aid of a Resolvent Sextic. Amer Math. 1885;7:170–177. Bonaya SB. A calculator for polynomial equations of degree 5 and above. 2013. Buya SB. A formula for solving general quintics: A foundation for solving general polynomials of higher degrees, online (open access) e2350495. Buya SB Disproof of Abel’s impossibility theorem, online (open acess) e203050460.2013.